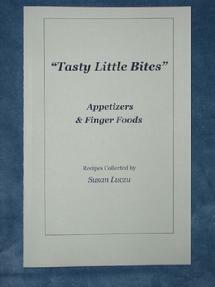 1) I have put together a collection of "Appetizer and Finger Foods" that I have used successfully over the years, doing everything from baby showers to Victorian Teas. 2) I also just finished a cook booklet on "The Allure of Chocolate" - recipes from the seven years of programs. Please be sure to include your name, address, zip code, phone number and note which booklet you are ordering - also, number of copies in your order. Exciting news! I have been working on a family cookbook and will be taking it to California in early August for it's premier! It is called "Growing Up in the ADAMS FAMILY" and includes a collection of family recipes, memories and pictures. I am excited about sharing my heritage and recipes from my Grandmother Adams with both my family and friends. Watch for further information on this soon!